This is the first game in the Speed Race series. For other games in the series see the Speed Race category. 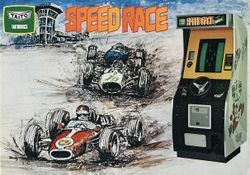 Speed Race is a racing arcade game, released by Taito Corporation, (in 1974); it had been designed by Tomohiro Nishikado (who later went on to design the legendary Space Invaders). The player must use a steering wheel and gear shifter to take control of a car with a single pedal to make it accelerate - and the track width shall widen and narrow as the game progresses along with the number of CPU-controlled cars increasing with the player's score. "Slip Zones" in which some careful driving must be executed will also appear on the track at 800, 1800, and 2800 points; the timer will also be extended at 2000, 4000, and 6000 points. This is the first game in the Speed Race series - and it was followed by six sequels: Speed Race Twin (1976), Super Speed Race (1977), Super Speed Race V (1978), Speed Race GP-5 (1979), Super Speed Race GP-V (1980), and Super Speed Race Jr. (1985). This initial title was also re-released by Taito Corporation as "Speed Race Deluxe", in 1975. Speed Race · Speed Race Twin · Super Speed Race · Super Speed Race V · Speed Race GP-5 · Super Speed Race GP-V · Super Speed Race Jr. This page was last edited on 14 April 2015, at 17:30.